STOP PRESS: St Cybi’s Church, Holyhead, have been granted funding for significant repairs, costing over £250,000 to preserve the stonework, including important carvings, at St Cybi’s Church, Holyhead, which are being damaged by erosion and pollution. The Church is pleased to announce, subject to a successful round two grant from the Heritage Lottery Fund, it has now secured the necessary funding and authorities to start the work in the early part of 2019. Funding has been provided by Heritage Lottery Fund (£158,500), W G Roberts Fund (£30,000), Garfield Weston Foundation (£10,0000), James Pantyfedwen Foundation (£5,000) Allchurches Trust (£3,000) and the Representative Body of the Church in Wales (£3,000). These grants will help to preserve the church, and important part of the town and local community for generations to come. You are warmly welcomed to join us. We meet on Sunday at 11 am, or Wednesday at 10.30 am for a mid-week service. When there is a fifth Sunday in the month a joint Ministry Area service is held at 10.30 am – details on church noticeboard. After the service you can join us for tea, coffee and chat in the tiny old school house in the grounds known as Eglwys y Bedd. There is also a special Eucharist in Welsh (Offeren) on the 3rd Sunday of each month at 5pm and each season an open bible study on Thursday evenings at 6.30pm held in our sister church Saint David’s, Ffordd Tudor, Morawelon. The Church is the centre of Holyhead between the new Celtic Gateway Bridge and Stanley Street. Following the appointment of the Revd Dr Kevin Ellis as Ministry Area Leader of Bro Eleth, the Bro Cybi Ministry Area is currently in an Interregnum. Nestled within the walls of the abandoned Roman Fort, Caer Gybi, is the ancient church of St Cybi’s Holyhead, founded in 540 AD. Now visited by tourists from around the world, the bi-lingual church has been central to the Holyhead community for well over a thousand years. 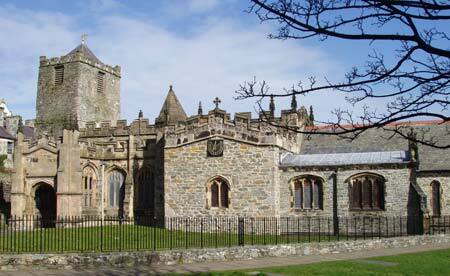 Please visit the ‘Friends of St Cybi’ Site for further information on the history of our lovely church. Mae’r wefan hon yn cael ei hadeiladu ar hyn o bryd. Pan fydd y fersiwn Saesneg wedi ei gwblhau, byddwn yn trefnu i gyfieithiad Cymraeg gael eu hychwanegu. This website is currently being built. When the English version is complete we will be arranging for a Welsh translation to be added.